Does your school district have enough bandwidth to support growing technology needs in your classrooms? Our team will explain how we can support your district in upgrading to robust bandwidth today and ensure scalability for future classroom needs. Presented by EducationSuperHighway as part of the NJ K-12 Broadband Initiative. Learn how VMWare solution services can accelerate your time to market to solutions including 1 to 1 End User Computing (digital backpack),infrastructure health and optimization, and security. Learn how to save money on 21st century classroom solutions through the NJSBA cooperative purchasing agreement. This agreement eliminates the need for your district to undergo the competitive bidding process, saving both time and money. NJSBA’s 21st century classroom solutions can help you identify and select the technology and services that will meet your district goals and ensure that your investment is efficient, secure and cost-effective. E-rate: What’s new for 2018-2019? Have you ever wondered how E-rate works and the best ways to get started? For a crash course in everything E-rate, our team of experts will provide you with an in-depth overview to support you this E-rate cycle. 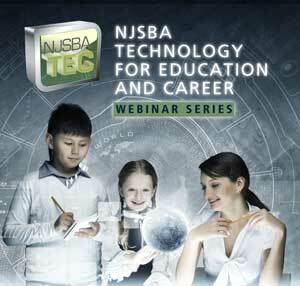 Presented by EducationSuperHighway as part of the NJ K-12 Broadband Initiative. iSchool Initiative provides unique services designed to help build positive culture and empower students to become lifelong learners and leaders. iSchool Initiative accomplishes this by empowering students to have a voice in their education, supporting teachers’ use of technology in the classroom, and working with board members and administrators to create a top-down vision for a bold, forward-thinking educational culture. During this webinar, learn about ways your district can benefit from the iSchool initiative. Fusfoo, a new free tool offered through the NJSBA TEC program, gives high school students a safe, bully-free, educational and engaging space for content to be created, curated, shared and consumed. Your school’s editorial and video content will be created by your students - for your students and available across all devices. Students can export their portfolio of work for college applications and internship and job interviews. During this webinar, learn about all of the ways your school can benefit from Fusfoo.